Posted 22 December 2013 & filed under 1930s, 1940s, 1950s, Jack Knight, People, Places and spaces, Streets, Work. Jack was born In Fishpool Street in 1921. He can remember before the lake in Verulamium was built. After he came out of the army he and his wife were living in the overcrowded family home. They applied to the council and they were allocated one of the first houses in Nuns Lane in 1949. He lived there for 19 years. Jack has many memories of the area including the farms and old cottages. 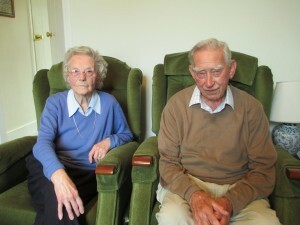 Jack remembers Sopwell House which was then occupied by Major Geoffrey Barnett and his wife Eileen and son Cedric. Sopwell House was known as Worley’s after Isabella Worley who used to live there. He also remembers Sopwell House when it was an old people’ s home run by Mrs Goddard.